Sherlock: The Abominable Bride is a stand-alone Christmas special for Steven Moffat's critically-acclaimed Sherlock series. 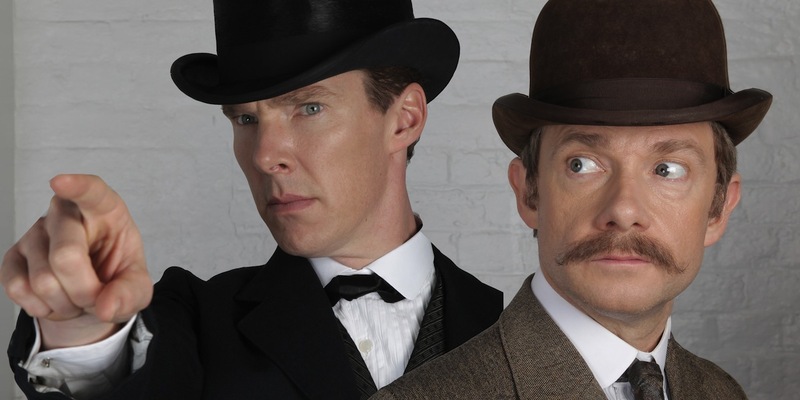 The beloved duo, Sherlock Holmes (Benedict Cumberbatch) and Doctor Watson (Martin Freeman), return in a one-off adventure set at the end of the 19th century - although as the episode progresses, it turns out that it is actually related to the modern Sherlock continuity. As the Victorian Holmes and Watson try to solve a series of murders, seemingly committed by the ghost of Emelia Ricoletti (Natasha O’Keeffe), their modern counterparts grapple with Moriarty's return and Holmes's drug addiction (or drug use, as he prefers to call it). The episode features the same mystery on two fronts: how does someone return after shooting themselves in the head? While Sherlock berates Watson for suspecting twins, it turns out that after eliminating the impossible, the solution is quite obvious: a KKK-inspired cult of suffragettes used Ricoletti as a martyr in order to kill the men in their lives who had raped and abused them. 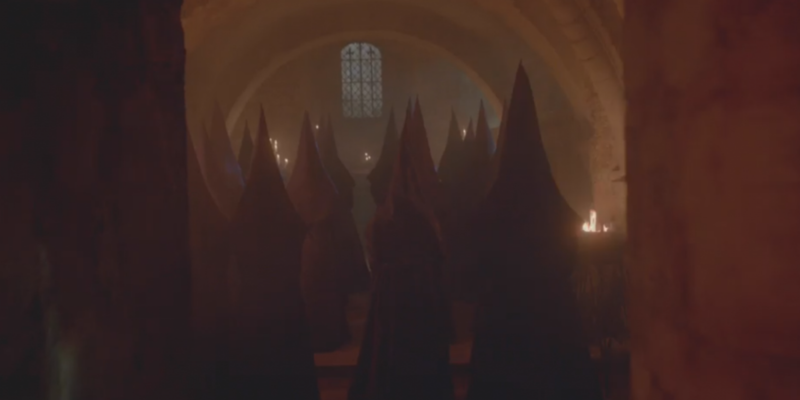 Holmes finds them chanting in a dilapidated church while wearing purple Klansman hoods and robes. For a show that prides itself on logic, it was surprising that the show opted for an ending could have only been dreamt up in the drug-induced stupor of an addict. What could have been a compelling mystery devolved quickly into a bizarre and hazy social commentary. The episode and its goals were muddled at best, but to utilize the KKK as an aesthetic or ideological point was tasteless and undermined any meaningful - if misguided - argument for equality. Previous episodes of Sherlock, to one degree or another, have taken inspiration from original stories by Sir Arthur Conan Doyle. 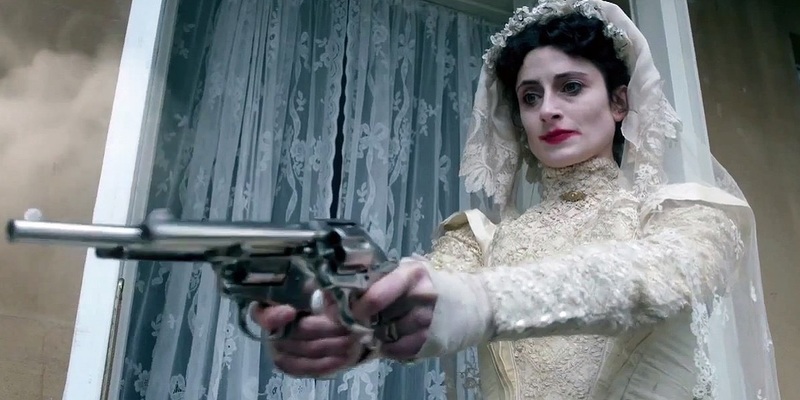 The name of this episode, however, "The Abominable Bride", is a passing reference to a case that Holmes investigated, but is never explained in a larger context. While watching the episode, however, a fan of the original short stories may have noticed a reference to "The Five Orange Pips", in which Sir Carmichael (Tim McInnerny) receives an envelope of orange pips one morning, driving his wife (Catherine McCormack) to seek Sherlock's aid. "The Five Orange Pips" features the KKK as the killer(s), who begin intimidating and killing men who have taken sensitive Klan information. However, in The Abominable Bride, the KKK is not present. Instead, the KKK acts as an inspiration for this secret suffragette movement - who have opted to change their robes to the feminine purple, in case the audience needed any additional hints to their gender. The conspiracy theorist's dream, these women have successfully infiltrated all parts of society, from the police morgue to the home of Doctor Watson, in order to get away with murder. The women's suffrage movements were not without flaws. Suffragettes, both in the UK and in the US, committed acts of violence and even terrorism as part of a political fight for the right to vote. Equally true, the suffragist movements of the 19th and early 20th centuries were white women who often used racially charged arguments to gain their own right to vote while continuing the oppression of people of color. The suffragist movement, however, was not the Ku Klux Klan. While the suffragist movement wanted to create progressive change, the Ku Klux Klan wanted to return to the past, the subjugation of African-Americans and the restoration of the institution of slavery. While the suffragists targeted political institutions of power, the Ku Klux Klan preyed on and murdered people of color - individuals whose existences they found threatening. Equating suffragists with the Ku Klux Klan is not only offensive to the memory of the women's suffrage movement, but is also a misunderstanding of the history of both political organizations. Suffragists in many ways paved the way for modern activists and feminists in the continued movement for gender equality. Throughout the episode, Sherlock and Watson were made aware by the women in their lives that Victorian society treated women as second-hand citizens. "The Abominable Bride" had the potential to convey a positive message about gender, both in the male-centric fictional world of Sherlock Holmes and more broadly. But as Sherlock preached to a room full of women that the fight for equality was a battle that men should lose, this message was derailed. Instead of showing empowered female characters, Sherlock's act of telling undermined the point that he was trying to make. Critics and fans quickly pointed out that this is "mansplaining" at its finest, and that the portrayal of suffragettes as a vengeful and murderous cult that kills the men who have wronged them is both historically inaccurate and plays into sexist and cliché tropes. Additionally, Sherlock's sympathy for this murderous cult has another unfortunate effect - when the lines between suffragette and Klansman are blurred, a sympathy for women and a sympathy for the racist organization also blur. It's unlikely that this was Steven Moffat or Mark Gatiss' intention, but it still remains that the narrative bend of the show does ask the audience to view people wearing the unmistakable dress of the Klan as noble rebels. While the UK-based show may not have taken this into consideration, the KKK is not only a part of America's past - it is still an existing organization that champions white supremacy in the United States to this day. The strangely comic nod to the Klan, with a group of women chanting while wearing purple hoods, is tasteless not only given the KKK's violence and racist past, but also the current and ongoing conversations about race and violence in America. With regards to the matter of race, it's also worth noting that Victorian England was not exclusively white, and historical accuracy is not a defense of the episode's lack of diversity. The erasure of people of color from the story actually heightens, rather than alleviates, the awkwardness of the brides' cult garb. In this episode, which is completely devoid of people of color, the purple-clad KKK is a group of women who prey on white men with the same sort of vigilante justice that the Klan believed was justified. "The Abominable Bride" attempted to bridge historical periods while dealing with complex themes and villains with sympathetic motives. Its scattered and muddled execution, however, created a tasteless ending that did not have any regard for the historical significance or modern ties of the suffragette movement or the Ku Klux Klan. If those who don't learn history are doomed to repeat it, then Moffat's attempt at progressive and innovative storytelling took a wonderful show and turned it into an misguided and dated mess. Sherlock: The Abominable Bride is currently available to stream on PBS in the U.S. and BBC iPlayer in the U.K. Sherlock season 4 is expected to premiere in 2017.